Utilities drive some of the largest construction budgets. Autodesk Building Information Modelling (BIM) for utility infrastructure design helps control costs by reducing rework, delays and construction waste through improved coordination, design accuracy and stakeholder communications. Read about customer projects and learn more about BIM software for the utilities industry. Learn how firms are transforming enterprise workflows using Autodesk BIM solutions for utility infrastructure. Duke Energy drives continuous innovation in design and business. Nashville Electric Services cut substation design time by 50% using 3D models. Sundt Construction keeps US$135 million project on budget and on schedule. Financial and service performance using model-based design and visualisation. Access webcasts, videos and studies to learn more about how utilities benefit from BIM solutions. Autodesk BIM software for utility infrastructure design can help you to get the right information to the right people at the right time. 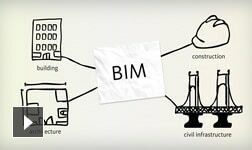 Civil engineering tools accelerate BIM transition. Design and documentation software for BIM workflows. 3D conceptual design software to communicate utility design proposals.